Want a Pimp Stitch Kit? Green Jello is giving away one of our Pimp Stitch Kits since we accidentally sent her two! So shoot over there and comment for a chance to win it! We always say how much we love seeing your finished objects in the flickr group, we mean it...we really love it and this week we couldn't decide what we liked best, so here is some projects from Flickr user: ItsARaggedylife in the left hand column and user: lissaknit in the right. This is an off week for us girls here at Pimp Stitch, so no new patterns. So sad. But next week we are back on and coming at ya with Halloween inspired patterns sure to scare you with the cuteness! So what are these girls up to when they are Pimping Stitches? Thier day jobs, of course. 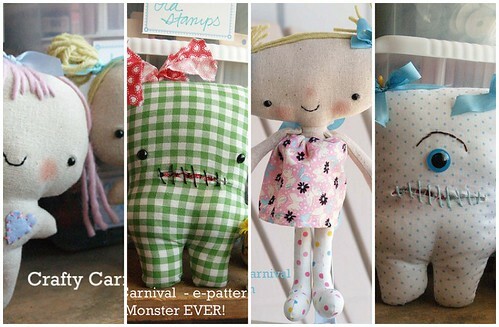 Missy Ballance of Crafty Carnival has release some adorable new sewing e-patterns in her etsy shop. Lauren Brandy over at Goody-Goody has a super cute Spool Doll Tutorial up on her blog that was written by guest blogger Missy! 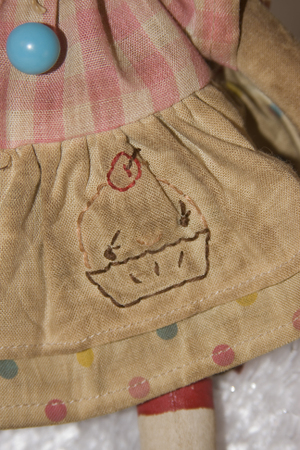 She aslo has some adorable totes and aprons up in her etsy shop. 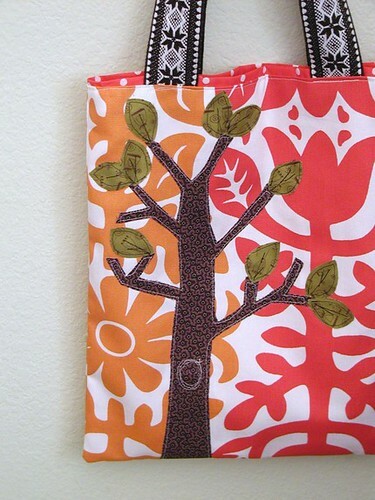 Below is her Tree of Life tote which is beautiful. Check it out! Up next is Amy Cluck of Peptogirl! She's been all over blogland as of late being featured on Funky Finds and Craft Gossip where she was interviewed by the fabulous Jennifer Perkins of Naughty Secretary Club! Amy's famous! If you haven't discovered her amazing jewelry yet, here's a taste of what you can find (very affordably, might I add) in her etsy shop. As for Tamie Snow of Roxycraft, her new crochet book Tiny Yarn Animals releases to all major booksellers on August 5th and is available for pre-order on Amazon and elsewhere now. If you live in the Sacramento Area, she'll be signing copies of Tiny Yarn Animals at the Borders Store of Fair Oaks Blvd on August 7th at 7pm. Right now, you can pick up the latest issue of Woman's Day Magazine to see a feature on the book and Tamie. 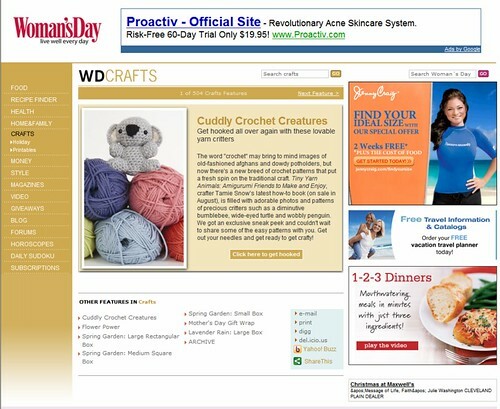 Or you can grab up a free free patterns in the Woman's Day website. She also has a new pattern called The Yeti available on her website now. And this week only your can buy all her patterns bundled together for 75% off list price. So check it out. Get em before they disappear! Everything you need to get your stitchin' on! 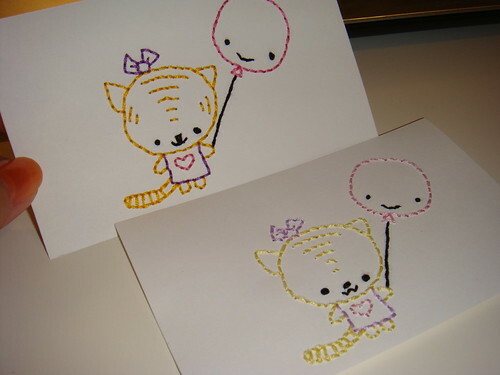 Just use transfer paper or pencil to trace the designs on fabric. Transfer paper or carbon paper can be found at most craft or sewing stores. A perfect treat for yourself or the stitcher in your life! Etsy Shop - Pimp Stitch Kits for Sale! Drum roll please! 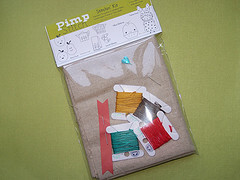 We have just released some Pimp Stitch Kits in our brand-spanking-new Etsy shop! They are super-cute and quantities are limited so get yours while you still can. We all have new patterns for you this week! * brand new collections to choose from and boy, are they good! From Tamie Snow we have "For the Love of Ewe" and "Ocean Wonders"
Amy Cluck brings us "Birds of a Feather" and "Indie Wedding"
and Lauren Brandy takes us to the "French Bakery" and chills us out with "Feeling Fall"
We should have those kits you all loved so much in our brand spanking new etsy shop today or tomorrow, so stay tuned! July 29th is a big day here at Pimp Stitch. The free patterns will be expiring and each of us will consolidate our 6 existing patterns collections plus our individual free patterns into our "Summer '08" Bundles. At that point the patterns will no longer be available for individual purchase. But Starting in August, we'll be releasing new individual $3.00 pattern collections again for fall. Also in August we'll be featuring guest artist Kristen Rask of Schmancy Toys. We'll be interviewing her and giving you a free pattern designed by her. Interested in being or want to nominate someone to be our Featured Artist in the future? Email us and tell us about youself/them. Don't forget to add your finished projects to our Flickr Group! You could be featured here on the blog. We LOVE it when you guys post to the Flickr Pool! It's so fun to see the creative things you guys come up with! 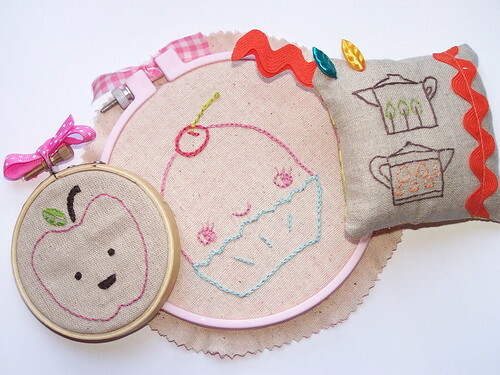 Today we're featuring two really fun projects you can use Pimp Stitch Patterns to make! First is a two-sided pillow made by flickr user sockmonkeysunite. One side has Missy's "Let's Get this Party Started" patterns and on the flip side is Tamie's "The Party's Over" Pattern. So cute and very clever! Next is a cute little baby bib made by Flickr user sewitsforyou. She use Amy's "Get Your Party On!" pattern and added the name of the babe below...adorable! What kid wouldn't like a cupcake at such close proximity? Giveaway - Pimp Stitch Kit Winner Announced! We used the Random Number Generator to pick the winner today from 149 entires and the number was 9! Our Winner is Veronica of Whimsology!!! 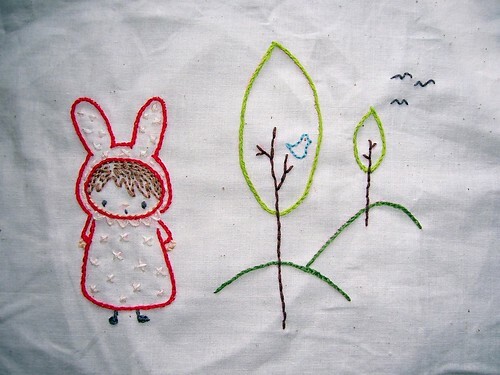 Pop over to her website for some amazing artwork and embroidery inspiration. I've officially been "Wow'ed" by it! We put together some kickass kits for Renegade but unfortunately, we didn't make it. Our loss is your gain because we have a kit to give away this week! Just comment and we'll pick a winner at random on Friday! 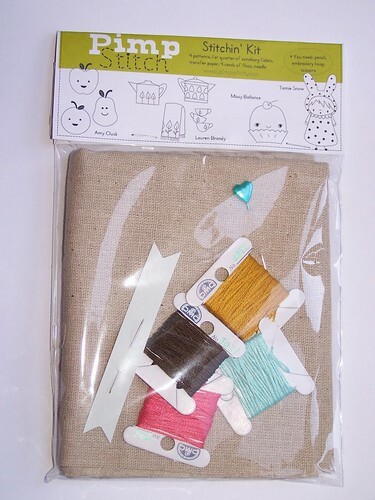 Each kit has a full fat quater of osnaburg fabric, 4 colors of floss, an embroidery needle and a super cute staight pin for pinning your pattern to your fabric for transfer! Of course there's also patterns...a sampling from each of us. So whatcha waiting for? Comment here and WIN! Stay tuned for new pattern releases next Tuesday! We're on Vaca so We're Letting YOU do the Work for Us! For those of you who don't know, Tamie is on vaca in Hawaii so we thought we'd all take a mini vacation this week. Sorry - no new patterns! But we'll be back into the full swing of things next week with some sort of pattern release and/or some bloggy goodness. Since we are taking the week off from stitching, we're going to show off all the amazing things that people have been doing with our patterns. If you haven't already done so, be sure to join the Pimp Stitch Flickr Group — we want to see what YOU'VE been making! 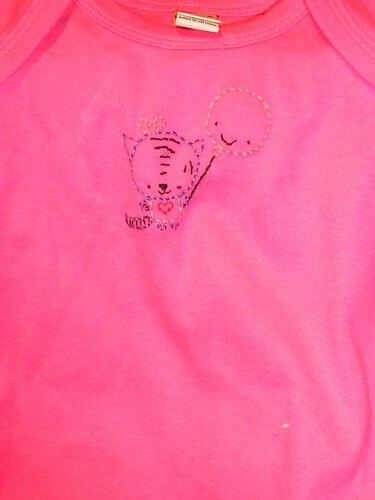 Embroidered onsie by sewitsforyou, using part of Missy's free pattern. Embroidered card by xxk4r3nxx, using part of Missy's free pattern. Embroidery by oipom, using To Grandmother's House We Go pattern by Tamie. 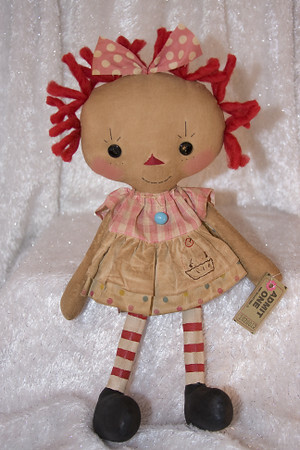 And this little cutie, by Missy's bff Nicole of Raggedy Old Annies! This pattern is not yet available through the web site, but you can purchase it as part of a Pimp Stitch Favorites Collection/ Embroidery Kit at Renegade this Saturday and Sunday in San Francisco. And if you can't make it out to San Fran, we'll be giving away one of these kits via blog next week so be sure to check back. P.S.) There's going to be over 200 vendors at Renegade, so look for booth number 122! You can pick up your kits from Amy so keep an eye out for Peptogirl Industries, just look for lots and lots of pink!